set up their seeder to accurately and reliably inject trace elements, fungicides and liquid fertilizers into the furrow. It was designed after much testing and consultation with farmers to allow the end user to easily and confidently fit the kit regardless of size, brand or varying application rates. pumps and controllers to suit everything from small trial plot seeders up to the largest of air seeders. Stoll’s can also supply all your liquid fertilizer storage and handling needs including bulk tanks, pumps, hoses, camlocks and fittings etc. the harsh environment of liquid fertilizer. Why Choose Stoll Liquid Inject? All our tanks are UV stabilized, heavy walled polyethylene tanks. They are low profile for even weight distribution and pin mounted for ease of attachment to your seeder. A carefully chosen filtration system is a key component to a good liquid injection system. Our system consists of a large capacity 1 ½” primary filter, and a 1 ½” self-cleaning filter in the main pressure line out of the pump. and reliability being of the utmost importance. Our precision CNC machined manifolds are available with either 10, 20 or 30 outlets. These manifolds can be mounted at each head or anywhere across the bar. Our first option is our extremely popular do it yourself kit. This kit is unique from other systems as it allows you to use any existing equipment you may already have including tanks, pumps and rate controllers etc. It enables you to get into an extremely high quality kit for a modest price and really test out the benefits of liquids without a large capital outlay. The kit is very user friendly to operate and is easily set up on any seeder. Furthermore, it is designed to be easily upgradeable in future years if you want to add things such as rate control, auto section control or even variable rate. You may have an old computorspray or trailing sprayrig that you want to modify, or even turn one of the bins on your airseeder into a liquid tank – whatever your application this kit is flexible enough to accommodate your needs. Simply go through our step by step process and choose the components you need – it’s that easy. Tanks are available with or without a tank frame – tank frame is galvanized steel. Hydraulically driven HYPRO 1 ½” stainless steel pump – provides a massive flow of 416L/min (302L/min for poly version) giving ample agitation. The filtration kit comes complete with a large capacity 1 ½” suction filter and an 1 ¼” self-cleaning in-line pressure filter. 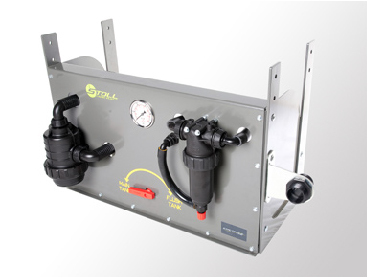 All hoses in the kit are chemical grade hose and come complete with all the necessary fittings and clamps to connect to your pump, filtration system and manifolds. High quality ARAG 463 series control manifold complete with highflow 1” throttling valve, agitator tap and 12V electric on/off valve. Precision CNC machined polypropylene manifolds complete with push fittings and all mounting brackets. Our tine injector unit consists of our own custom designed ‘Exacta-Flo’ metering nozzle mounted into an in-line checkvalve. For those who are after precise application the TeeJet 844e Rate Controller is the perfect answer. Dosing systems along with GPS / variable rate systems can be added to the liquid inject system, or we can link the system with your existing GPS equipment. Our second option is a complete ready to bolt on module housed in our own custom designed stainless steel cabinet. The module is available in standard (STD) configuration or rate control ready (RCR). The STD configuration includes 12V controls to turn the system on/off from the cab and an adjustable throttling valve to set your operating pressure - you then drive to a set speed to ensure your application rate stays constant. Hydraulically driven stainless steel hypro pump with cab mounted low pressure alarm. Large capacity 1 ½" 316 series suction filter. 1 ½" self-cleaning pressure filter. 3-way panel mounted ball valve to easily change from your main tank to your flush tank. High flow throttling valve with bypass agitation back to tank. Agitator tap for our dual venture agitators. All hoses and fittings to connect to tank and to distribution manifold. Electromagnetic flowmeter which has no moving parts, internal passage of stainless steel, is highly accurate, and doesn't change its readings when measuring liquid with different viscosities any different making it the best choice when using liquid fertilizers. We can supply the RCR model with a TeeJet 844e automatic rate controller or can set it up to use with your existing GPS / rate control equipment. We can also supply the Trimble EZ-Guide 500 or FMX guidance system complete with EZ-Boom and rate control capabilities to do Variable rate fertilizer application. To price up one of these kits simply choose the STD or RCR module, add your choice of standard or deluxe head manifolds and add your number of tynes. Download Brochure and go to Option 2 for further information and pricing. Our third option is our exclusive N-JECT LF system from Capstan (America). Stoll's are the distributor for this product in Australia and it is the most advanced liquid fertilizer delivery system on the market. It uses advanced PWM technology to regulate the flow to the tines rather than a traditional orifice based system. The PWM valves act like a fuel injector in a car, they actually pulse very quickly to regulate the flow. The pressure in the system remains the same but as you speed up / slow down or want to variably apply fertilizer according to a prescription map the PWM valves pulse faster or slower. This system is excellent for those who want the ultimate in accuracy or want variable rate capabilities as you have the ability to apply product over a much wider application rate and can even vary the rate across the bar or turn individual sections on/off etc.